Along the north sides of the chest are panels containing the images of the two infant sons, although not depicted as such but as kneeling youths. 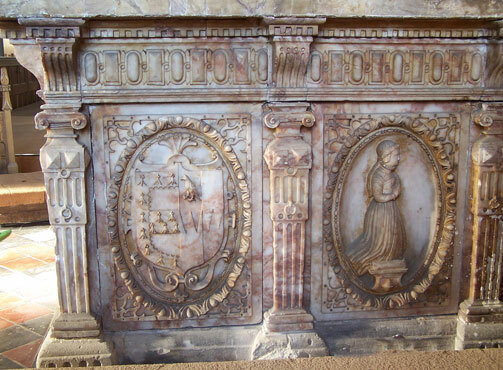 The centre panel of the south side has the kneeling image of Joyce, the daughter and heir who erected the tomb. 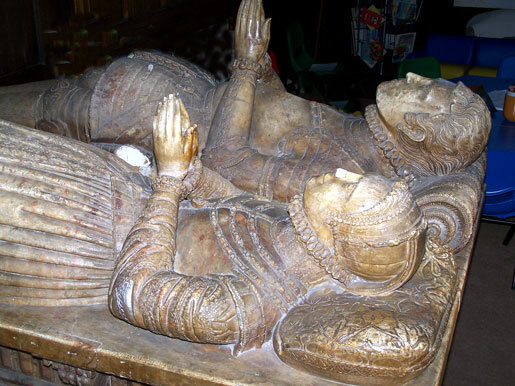 She outlived her father by 49 years, dying at the age of 63 in February 1595/6. 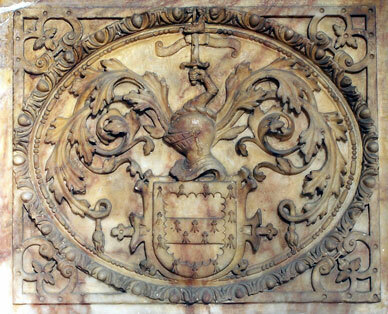 As the inscription relates, she was espoused to Sir Thomas Lucy of Charlecote, Warwickshire at the age of 12. 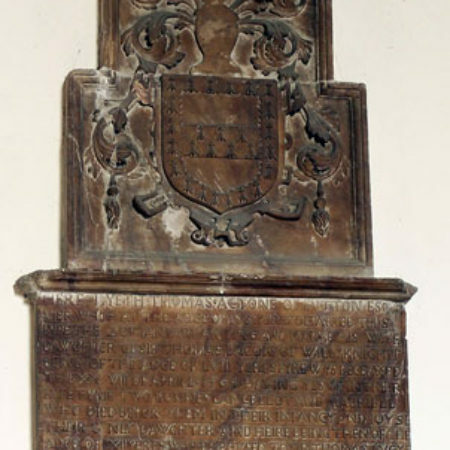 He commemorated her in the church at Charlecote with a monument from a London or Southwark workshop that has a long inscription written by him in her praise. The west end of the chest is occupied by an achievement of the Acton arms. Unlike the other panels, the oval that contains it is set horizontally. It is derived directly from a print published in 1560 by Hans Vredeman de Vries. It comes from a set of architectural views set in ovals with strap-work ‘spandrels’ around them but the particular plate used, the front page, contained an achievement and a dedication instead and the oval was set vertically. 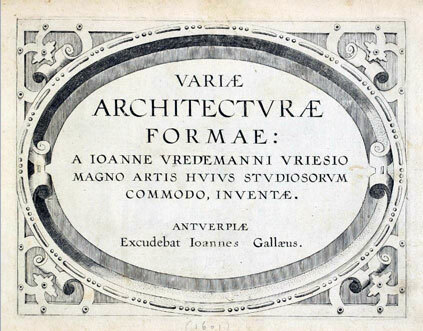 However, when the set was republished coupled with another in 1601, this plate was re-engraved as the title page of Formæ Variæ Architecturæ, replacing the arms and dedication, with the oval horizontal, as on the tomb. The sculptor has inserted an oval of egg-and-dart inside de Vries’s bead-and-reel to good effect. 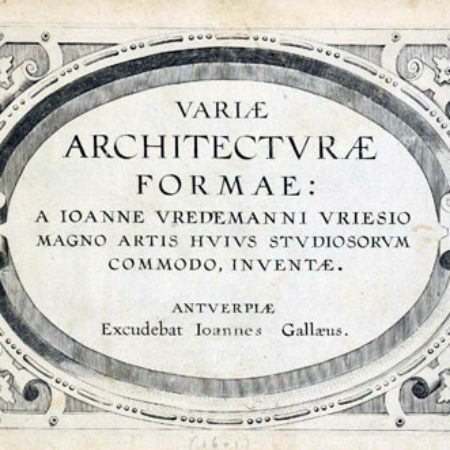 He probably derived the pilasters from another work by de Vries, adapting features from plate 5 of Das Ander Buch but, as was so generally the case in England before the time of Inigo Jones, he did not understand the rules of classical architecture: he used features of both the Doric and Ionic orders (as de Vries did on his plate) and even turned his triglyphs into ‘quadriglyphs’. I particularly like the gadrooning on the frieze, alternating oblong and rectangular shapes. The monument must have been made in the Midlands but most monuments of this time in the area belong to identifiable groups and there is nothing else quite like it. 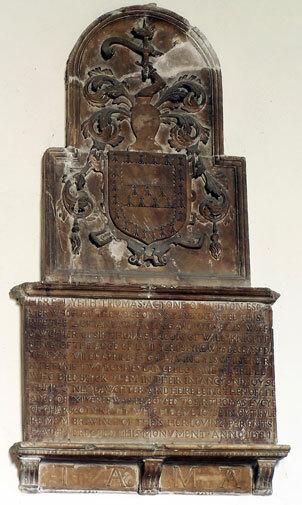 The earlier monument with alabaster effigies to Blanche Parry at Bacton in Herefordshire, erected before she made her first will in November 1578 has an inscription panel which, like the Acton panel, employs letters largely lacking serifs, unusual for the period, although Bacton has incised lettering, while Tenbury’s inscription is in relief. 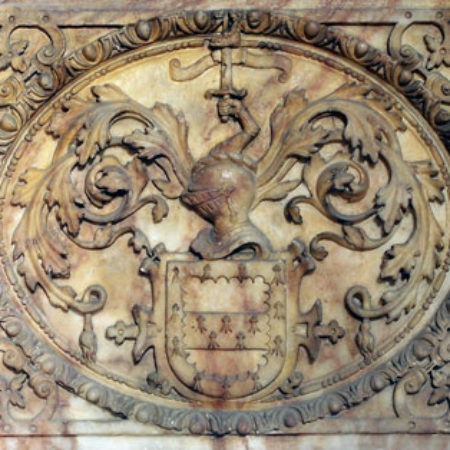 The general approach at Bacton is simpler but the guilloche pattern around the arch and the egg-and-dart decoration surrounding the panel on the tomb chest with their shields in strap-work suggest a sculptor who was aware of the same type of printed sources or was working from a design supplied by a Southwark sculptor. The likely explanation for the lack of other similar monuments is that the sculptor was generally employed on houses rather than monuments. 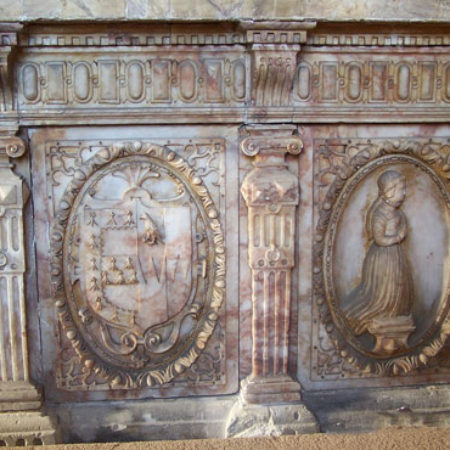 It is possible he was John Tarbook of Bewdley, carver, who signed an alabaster incised slab at Pitchford, Shropshire, in 1587 and initialled a similar one in the same church the same year. The decoration on Thomas Acton’s armour is, allowing for the difference between sculpture and engraving, very similar to that on the armours of Adam and Richard Ottley at Pitchford but the incised lettering of the inscriptions is very different. 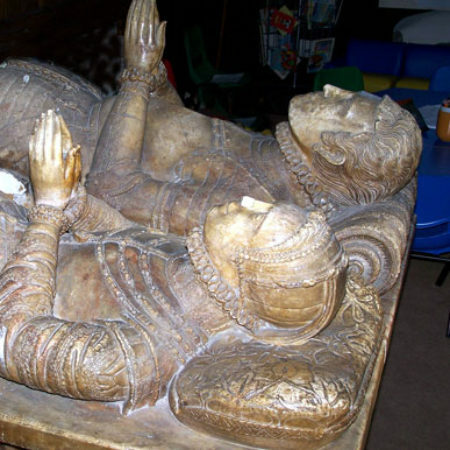 Perhaps Joyce Lucy turned to her cousin Henry Acton of Ribbesford, the parish in which Bewdley is situated, to find a local man to make the tomb for her, rather than use a man based nearer to Charlecote. 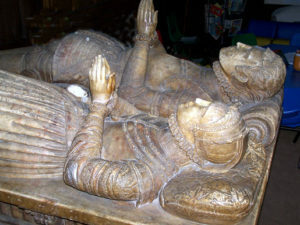 The wooden monument to Francis Walsh, died 1596, at Shelsley Walsh in Worcestershire has similarly shaped pilasters to those at Tenbury Wells and may be the work of the same man.